Adapting existing promotional or sales documentation to digital format is not just a matter of scanning you stuff and dumping it on CD or the WEB. It doesn't mean you have to throw everything out and start over either. We rethink your stuff interactively to make sure you get the most out of your digital medium. Any existing promotional or sales tools (brochures, catalogues, audio or video tapes or database) can be adapted to CDROM or the WEB. Doing your storyboard with us means that talented graphic artists and programmers will help you understand how the process works, what is and isn't possible and how long it will take. Babel Media Communication specialises in digital media adaptation. 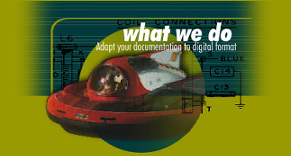 Whether you are porting your graphics, animations, videos, sound, text or databases to the WEB or to CDROM, we will find a way to create a digital presentation that seamlessly integrates your existing documentation to digital media.